Walking through Audioboo from Mark Rock on Vimeo. IN January I spent an entertaining evening down in London discussing different methods and techniques independent publishers could use to make a success of locally driven websites. One of the tools featured was AudioBoo, which at the time was very close to being launched and offers an audio publishing service on an iPhone. The developers of the services, Best Before Media, recently made it publicly available for iPhone users to install for free on their phones. AudioBoo is designed as a very simple way to record conversations and then publish them to the AudioBoo website, but it is also possible to embed the recording into your own site as well as notify Facebook and Twitter of new recordings, or Boos. As you can see from the video above it is possible to tag a Boo with descriptive words, assign a photograph and it also uses the geolocation facility in the iPhone to plot a point where the recording was made on a Google map. The potential for journalists to use this was highlighted this weekend by James Hatts of the LondonSE1 website, who reported from a fire on New Kent Road. The ease with which this service could be used during sport matches, local events and festivals, as well as interviews really opens up an opportunity for local journalists to feed stories back into their websites, as well as other corners of the web. THERE is plenty of opportunity to meet people and brush up on a few of your creative skills over the coming weeks in and around Manchester. Large companies are cutting down costs and headcounts with significant hits on R&D. In most cases all R&D spend has been frozen or cancelled. This is a great time for tech startups to innovate, prove concepts and be there strong when the economy recovers, on Wednesday, January 28. The last event saw six small break-out groups gather together around a table and a pint or two to discuss everything from starting up a blog, getting the best out of social media and using sites like Facebook in teaching. The next event is sure to be just as interesting, challenging and involving regardless of where you consider yourself to be on the internet ladder, on Tuesday, February 3. Another interesting gathering together of newspaper people who have grasped the digital nettle and looked at ways to make it work in a news environment. The network is free to attend and draws a number of journalists and website editors from the north west and the Midlands, with the added bonus of Robert Peston taking part in an early evening discussion on the impact financial journalism has on the economy, on Tuesday, February 3. My journalist pal Judy Goodwin, who has offered up some simple PR tips in the past on the site, brings her experience to journalists and writers who have to interview people for their stories. The all day course costs just £45 and I know friends have gained much from attending her courses, on Saturday, February 7. I HAVE written a couple of articles for This French Life recently that may appeal if the responsibility of running the website falls on your shoulders. Both pieces use services provided by Google, the first looks at building a contact form in Google Docs. While the second one describes how to set up an availability calendar, but it wouldn't be too difficult to use one as a What's On guide or a list of future events. And of course one of the best bits is that they are free, but you can also access each service from anywhere as well as analyse or republish the data in different formats. IF you need a case study of how to launch a change or update to your service and upset existing users, drop in on the Yahoo! Profiles blog and read a few comments. Without any warning Yahoo! swapped across its members to a new profile page system, which they thought would prove more open and popular, problem was they didn't give users a chance to check it out first. So the blog has now received close on 1,000 comments, and there are only two articles, many of which complain of lost information, endless verification loops and most probably will see Yahoo! membership numbers plummet. Maybe the only way out for Yahoo! is to try and turn things around in the style of Dell Computers who pulled the whiskers of Jeff Jarvis by providing poor service, yet listened to Jeff and other customers to disentangle themselves from a real mess. A VERY smart use of the Dipity timeline service from the Manchester Evening News as it tracks the evolving congestion charge story. It is a great way for people to visualise and track a story over long periods of time, as well as a way for a publisher to draw articles out of the archive. Straight off the top of my head I could see this being used to track sports reports over a season, as well as things like theatre and gig reviews. And as Dipity timelines can be shared across the web with the insertion of a short line of code it is a simple way to get your work in front of new readers. To see a full size version of the timeline check out the MEN's Congestion charge: The story so far. HERE are a couple of examples of making the new tools of the internet work for you as a journalist, without adding greatly to your workload. The YouTube video above has been produced by a journalist friend of mine, George Dearsley, who has combined an audio interview with some images, something you could do with Windows Movie Maker, to add some colour to his chat with the Co-op's Simon Williams. And the Guardian's Kevin Anderson highlighted the use of Twitter by the newspaper's Michael White as he reports on Prime Minister's Questions from Parliament. ONE of the criticisms levelled at the BBC website is that it doesn't return enough to the wider internet, be that by just linking out more to other sites. 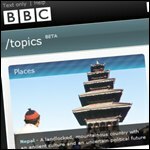 Well its new BBC Topics offering could be the perfect vehicle for doing just that. The service automatically gathers together stories, images, audio and video from the BBC around particular subjects, so you have pages for Charles Dickens, inflation and Peru. I'M playing Devil's advocate here but with Greater Manchester Police building up a presence on Facebook that lets them issue localised news updates, promote video appeals and have their contact details just a click away, is another 'essential' role of newspapers being eroded? "I think we're probably the last generation that's going to make a living out of newspapers. I suspect in 10 years' time it's going to be much harder to turn a shilling." "It became an exercise in ‘web 2.0′ - open source tools, free online services, RSS feeds, and a willingness to experiment." "Denied the time, money and resources to do the job properly, many hacks now churn out stories without checking facts or sources." "This case study demonstrates how a locally-focused blog attracted a following, advertisers and turned itself into a print publication." This is something the BBC website lets you do to a degree from its front page, but it only focusses on stories from its own newsrooms. Whilst those newspapers who see Google News as a threat and block the search engine's spiders may need to think again.